Zero production impact. Since traffic is duplicated, any bugs in services that are processing shadow data have no impact on production. Test persistent services. Since there is no production impact, shadowing provides a powerful technique to test persistent services. You can configure your test service to store data in a test database, and shadow traffic to your test service for testing. Both blue/green deployments and canary deployments require more machinery for testing. Test the actual behavior of a service. When used in conjunction with tools such as Twitter's Diffy, shadowing lets you measure the behavior of your service and compare it with an expected output. A typical canary rollout catches exceptions (e.g., HTTP 500 errors), but what happens when your service has a logic error and is not returning an exception? Ambassador lets you easily shadow traffic to a given endpoint. In Ambassador, only requests are shadowed; responses from a service are dropped. All normal metrics are collected for the shadow services. This makes it easy to compare the performance of the shadow service versus the production service on the same data set. Ambassador also prioritizes the production path, i.e., it will return responses from the production service without waiting for any responses from the shadow service. In Ambassador, you can enable shadowing for a given mapping by setting shadow: true in your Mapping. One copy proceeds as if the shadowing Mapping was not present: the request is handed onward per the service(s) defined by the non-shadow Mappings, and the reply from whichever service is picked is handed back to the client. The second copy is handed to the service defined by the Mapping with shadow set. Any reply from this service is ignored, rather than being handed back to the client. Only a single shadow per resource can be specified (i.e., you can't shadow the same resource to more than 1 additional destination). In this situation, Ambassador will indicate an error in the diagnostic service, and only one shadow will be used. If you need to implement this type of use case, you should shadow traffic to a multicast proxy (or equivalent). You can shadow multiple different services. During shadowing, the host header is modified such that -shadow is appended. The following example may help illustrate how shadowing can be used. This first annotation sets up a basic mapping between the myservice Kubernetes service and the /myservice/ prefix, as expected. The prefix is set to be the same as the first annotation, which tells Ambassador which production traffic to shadow. 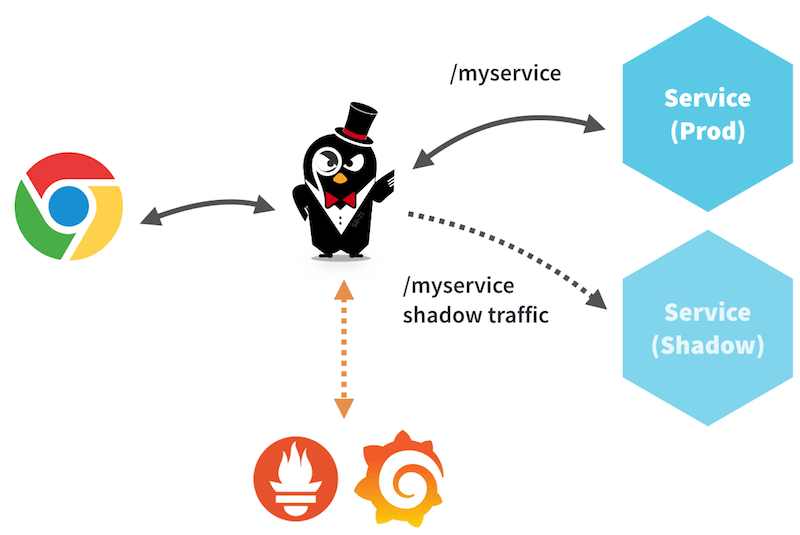 The destination service, where the shadow traffic is routed, is a different Kubernetes service, myservice-shadow. Finally, the shadow: true annotation actually enables shadowing.